Hudson Baby is a premium baby basics brand featuring stylish clothing, bath and bedding baby essentials. 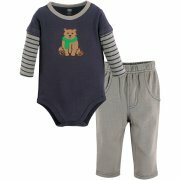 Hudson Baby Newborn Baby Long Sleeve Bodysuit & Pant features matching bodysuit with pants to fashionably dress your baby all year around. Made of 100% interlock cotton, our layette set is great for moms looking to purchase newborn essentials at an affordable price.